On Wednesday, September 14, the Bayonne Fire Department held a promotional ceremony for three officers in the City Council Chambers. The newly promoted officers are Battalion Chief Timothy Coughlin, Fire Captain Michael Petrakian, and Fire Captain Brian O’Sullivan. They achieved their higher ranks by excelling on state-administered promotional examinations. Speaking at the ceremony, Mayor Jimmy Davis congratulated the promoted officers. He said that “no city . . . can survive without its first line,” meaning its firefighters, police officers, and emergency medical personnel. Mayor Davis said that he has known Coughlin, Petrakian, and O’Sullivan for many years. He congratulated the firefighters’ families, and called them “the rock that stands behind” the firefighters. Public Safety Director Robert Kubert described the promotions as “well-deserved, well-earned.” Kubert advised the promoted officers to “pass on your experience” to the newer firefighters. Kubert thanked Mayor Davis and the City Council Members for recognizing the need for promotions, in order to fill the vacancies left by recently retired superior officers. 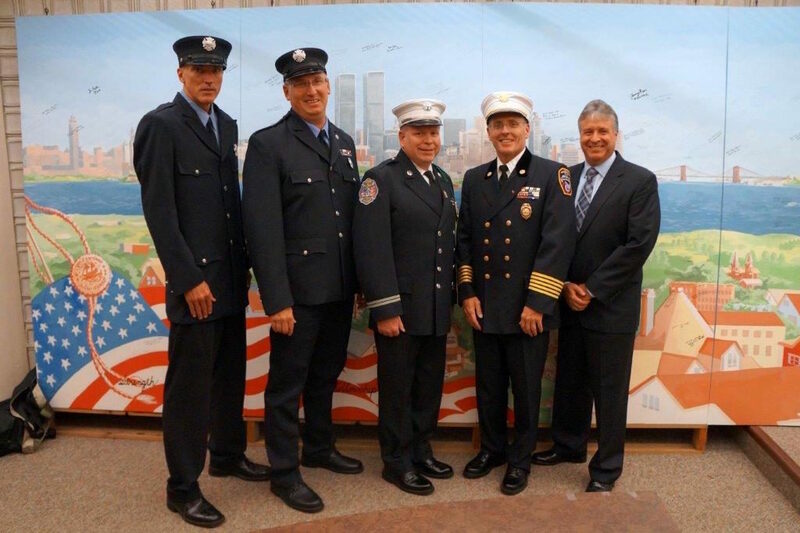 Kubert expressed gratitude for the sacrifices made by the firefighters’ families, who “gave up a lot of time” with them while the officers took classes and studied for their examinations. Battalion Chief Coughlin was appointed to the Bayonne Fire Department in 1990, and was assigned to Engine 3. Later, he was assigned to Engine 5. Coughlin was promoted to Lieutenant in 1999, and was assigned to Truck 1. In 2004, he was promoted to Captain, and was assigned to Squad 5. Currently, he is assigned to headquarters and has been performing the role of acting Battalion Chief of compliance. His licenses and certifications include: Incident Safety Officer, Fire Officer 1, Hazardous Materials Technician, and Rescue Swimmer. He has received the following recognition awards: Class C Valor Award, Director’s Award for Service, 9-11 Service Pin, two Departmental Commendations, and Special Recognition Awards from both the St. Barnabas Burn Foundation and the New Jersey Firemen’s Mutual Benevolent Association (FMBA). Captain Petrakian is a graduate of Bayonne High School. He was appointed to the Bayonne Fire Department in 1997. His assignments with the department have included Engine 3, Truck & Ladder 2, Engine 4, Aide to Battalion Chief 1, and the Multiple Services Unit. He is the former President of FMBA Local 11, and is also a former FMBA Trustee and State Delegate. Captain O’Sullivan is a graduate of Bayonne High School. He graduated from St. Peter’s College with a degree in Business Administration. He was employed previously in the financial sector with Prudential Securities and JP Morgan Chase. He was appointed to the Bayonne Fire Department in 1999, and was assigned to Engine 6 and Truck & Ladder 2. During the ceremony, City Clerk Robert F. Sloan administered the oaths of office. The Fire Department Honor Guard led the procession and the Pledge of Allegiance. Father John Fencik, Coordinator of the City’s 9-1-1 Communication Center, offered the invocation and the final prayer. Deputy Fire Chief Stephen Peterson and Deputy Chief William Bartos offered biographical comments about the promoted firefighters.